Blimey! Here Comes Trouble! A solo album from Bernie Marsden that isn’t a blues album. We haven’t one of those in over 30 years. Granted, there are blues licks a plenty, because that’s what he does, but this is harking back to his Parlophone days of “And About Time Too” and “Look At Me Now”. To that end, he’s wheeled in former Alaska colleague Rob Cass to produce, and dipped into his rolodex for some special guest stars. So the likes of Jimmy Copley, Ian Paice, Don Airey, Cherry Lee Mewis, Joe Bonamassa and Mark Feltham are brought along for the ride. Oh, yes, and some fella called David Coverdale. Now, I enjoyed it, but the mixture of styles does feel a tad jarring at times. With blues, AOR, boogie, seventies rock and some west coast rock, it doesn’t flow. However, his guitar work is absolutely delightful, and it’s good to hear him getting back to the top of his game. Mr Marsden said previously that the style of the album will harken back to the Whitesnake “Ready An’ Willing” era: “Kind of gone retro, but with a 2012-2013 sound, if you know what I mean.” And he’s not far off, although it’s more 1978 Snake than anything else. There are a handful of delights, with his cover of Danny Kirwan’s ‘Dragonfly’ (a Fleetwood Mac single from 1970), the title track, the Cherry Lee Mewis augmented ‘Bad Blood’ and the delightful ‘Ladyfriend’, the best of an enjoyable album. And, of course, the rejigged ‘Trouble’. It’s been a long time coming, but it’s certainly up there with the best of his solo albums. I applaud Bernie Marsden’s new album (and thanks to Stuart for a good review above) – oddly enough I thought the title-track one of the lesser ones… but more than made up by the rest. Presently enjoying the 2-cd anthology that came out a while ago – much great music from all eras of his work! Essential to any collection. 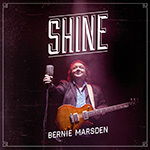 Bernie Marsden is special guest ‘live’ on the show from 9-11pm Bernie has a new solo album ‘Shine’ released this week, featuring guests, Joe Bonamassa, David Coverdale, Don Airey and Ian Paice.